Dianthus carthusianorum provides a splash of bright magenta from June until September, producing a succession of slender stems topped with a cluster of slightly fragrant flowers. 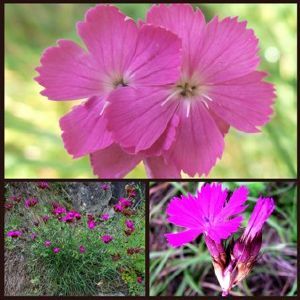 Dianthus cruentus is a stunning ‘Sweet William' perennial species native to Turkey and the Balkan Peninsula, where it grows best in soils that are dry to moderately moist. Dianthus cruentus has simple grass like leaves. The leaves are arranged alternately along the stems. They are lanceolate with entire margins and grey-green in colour. 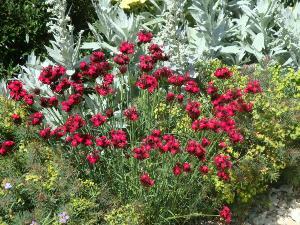 The flowers are many-petaled and red in colour, an unusual colour in Dianthus species. The plants bloom from June to July. The perennials grow to a height of approximately 70cm. 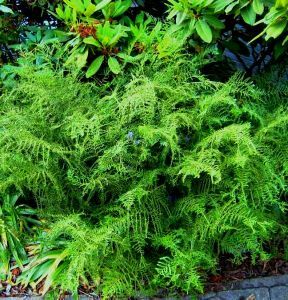 This species was shown and won great admiration at Chelsea Flower Show in 2011 within the Cleve West designed Daily Telegraph Garden which went on to win Best in Show. 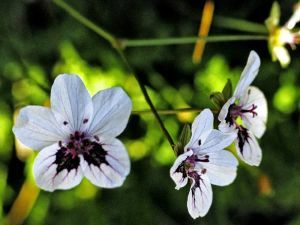 Erodium macradenum (glandulosum) is a charming long-blooming evergreen perennial alpine plant which forms a low tuft or mound of ferny olive-green leaves, effective as ground cover. Orchid-like flowers appear from late spring through to the fall, in a soft lavender shade with deep violet-black spots or eyes. One of the hardiest Heron's bill species, asking only for the excellent drainage provided by a rock garden, gravel scree or alpine trough. Divide clumps every 2 to 3 years in spring. Foliage is quite fragrant. A cousin to the familiar Crane's Bill Geraniums. Received a Royal Horticultural Society Award of Garden Merit. 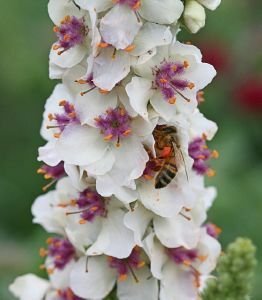 Verbascum chaixii ‘Wedding Candles' has basal rosettes of textured, ovate, grey-green leaves. Masses of white flowers with attractive violet filaments are held on candelabra like branches. 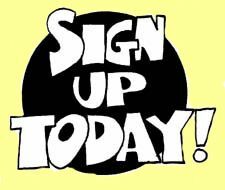 Flowers in late spring and will repeat flower throughout the summer with deadheading. Height up to 100cm.